Home Product Reviews Are You Ready For A Smart TV? There are smart bombs, smart watches, and of course smart phones, so why not smart televisions? Intrigued? Read on and take a look at four of the latest smart television models. First of all, let’s start out by defining exactly what constitutes a smart television. No, it’s not a television that has a degree from M.I.T. or comes equipped with an android brain. A smart television is an appliance that has its own Internet connection, thereby letting you stream from services like Hulu, Amazon Instant Video, and Netflix. These televisions provide you with some actual computing ability, so that you can perform functions like social media, instant messaging, or web surfing. The precise capabilities depend on the particular television. Smart tvs are also sometimes referred to as connected or hybrid tvs. This is a good, inexpensive entry in the smart television field. This model features HDTV capability, digital tuner, and built-in WiFi, to give you that Internet access that you know you want. The 60″ display is an LED panel with 1080p and a true 16:9 aspect ratio. The VIZIO also comes bundled with VIZIO Internet Apps Plus, which hooks you up with movies, music, tv shows, and Internet apps. It has a price in the mid-800 dollar range. There’s “high end” televisions, then there’s “You have got to be kidding” televisions. This Pioneer plasma display has an MSRP of $20,000. That’s not a typo. Twenty thousand bucks. But if you’re lucky, you can find an Internet deal for about ten or eleven thousand. This television, by all accounts, has a life-like, legendary viewing experience. The plasma display boasts an automatic conversion of any source to 768 progressive display, 16.77 million colors, 0.858 x 0.808 pixel pitch (mm), a viewing angle of 160 degrees x 160 degrees, and five cinema modes. It can connect with just about any device you can throw at it; DVD player, VCR, cable box, Playstation, laptop, video cameras, SkyNet … okay, so maybe not that last one. If you have the money for this one, go for it. Then please invite me over for a viewing party. Okay, time to return to the land of sanity. Coming in at around the $2300 range, this one’s a bit more doable than the Pioneer. You get access to built-in WiFi and the popular video on demand (VOD) apps like Netflix and Hulu, to name two. But the strength of this television is not in its Internet browsing abilities, which admittedly it falls a little short on. Rather, the drawing power of this smart television is its outstanding picture quality; it features a plasma display with a 64.7″ diagonal screen size, a pixel resolution of 1920 x 1080, and supports 2D to3D conversion in full HD. We end our list with an entry that resides comfortably between the Vizio and the Panasonic. If you prefer LED-based LCD televisions, then you have access to one of the best pictures that particular technology can offer. It provides you with a 45.0″ diagonal screen and pixel ratio of 1920 x 1080. Of course, you get the built-in WiFi, and a Quad Core processor so that you can multi-task and experience faster web browsing. 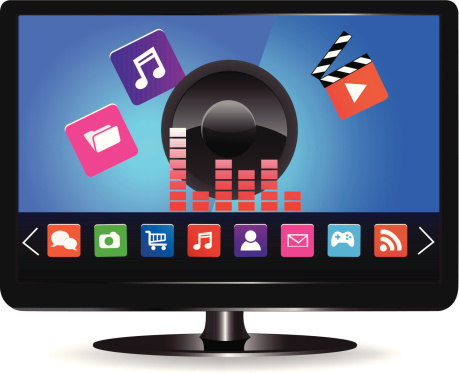 The Smart Hub smart tv interface, considered one of the better ones out there, is easy to navigate, and offers a wealth of VOD apps. All in all, a solid entry that will run you around $1700 if you’re lucky. If you want to learn more about smart televisions, check out this page and get brought up to speed on this fascinating (and addictive) bit of technology. Happy viewing!